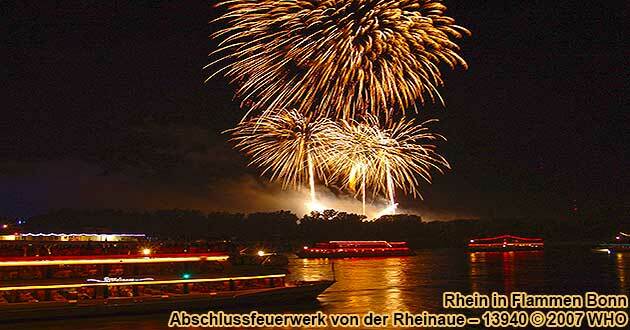 on seven mountains from Linz, through Remagen, the Rhine island Nonnenwerth near Bad Honnef, Konigswinter and Bonn with five fireworks displays. on Saturday, May 25, 2019. The page to book these boat tickets is written only in German, but if you have a question, you can call us and we can call you back: Phone +49 6744 7404. If you want to experience the "Rhine river in flames / Rhine river aflame at the seven mountains" from a boat of the "White Fleet", you should order the cards at a most possible early stage. Departure in Konigswinter on the Rhine river (right Rhine river side) from 4:15 p.m., departure 5:15 p.m. Round boat trip firework "Rhine in Flames". Seating place below deck, DJ music on board. Return in Konigswinter on the Rhine river at about 12:10 a.m. Boat tickets together with welcome drink and buffet per person 100 EUR. Departure in Bonn on the Rhine river (left Rhine river side) from 4:00 p.m., departure 4:15 p.m. Round boat trip firework "Rhine in Flames". Seating place below deck, DJ music and dance on board. Return in Bonn on the Rhine river at about 1:00 a.m. Boat tickets together with welcome drink, buffet and and drinks (beer, wine and non-alcoholic drinks) per person 132 EUR. Departure in Bonn on the Rhine river (left Rhine river side) from 4:00 p.m., departure 4:30 p.m. Round boat trip firework "Rhine in Flames". Seating place below deck, live music and dance on board. Return in Bonn on the Rhine river at about 12:00 a.m. Boat tickets together with welcome drink and 3-course menu per person 99 EUR. Embarkation in Bonn on the Rhine river (left Rhine river side) from 4:40 p.m., departure 5:00 p.m. Round boat trip firework "Rhine in Flames". Seating place below deck, live music on board. Disembarkation in Bonn about 12.30 a.m. or Bad Godesberg about 1:00 a.m. Boat tickets together with dinner per person 84.50 EUR. 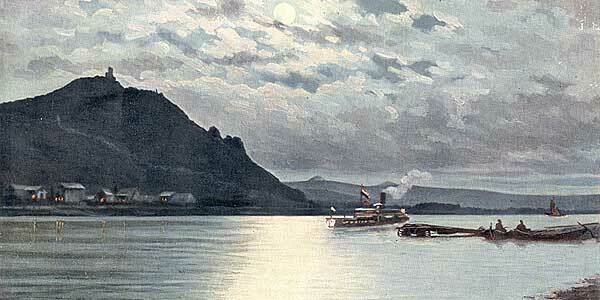 Embarkation in Bonn-Bad Godesberg on the Rhine river (left Rhine river side) from 5:50 p.m., departure 6:00 p.m. Round boat trip firework "Rhine in Flames". Seating place below deck, live music on board. Disembarkation in Bonn about 12.30 a.m. or Bad Godesberg about 1:00 a.m. Boat tickets together with dinner per person 84.50 EUR. 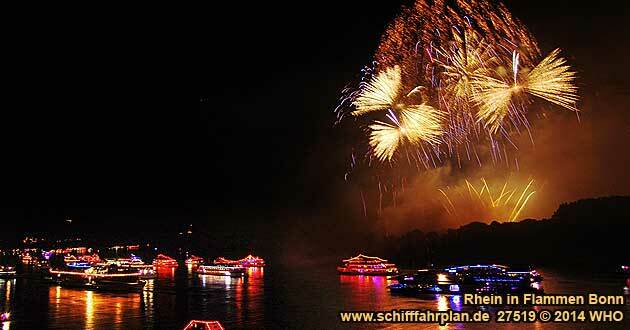 On one of the most beautiful current segments of the romantic Rhine river - between the "colorful town" Linz and the federal city Bonn - the Rhine river banks big illumination and firework displays "Rhine river in flames / Rhine river aflame at the seven mountains" takes place. For a festive season-opener the shore promenade and attractions of the on the Rhine river laid towns Linz, Erpel, Remagen, Unkel, Rheinbreitbach, Bad Honnef, Konigswinter and Bonn are lit in the red fluorescent glow of 2000 "Bengal Fire" lights. The red fluorescent Bengal Fire lights the way downstream for a fleet of more than 60 decorated and illuminated ships along a 26 km stretch - the longest stretch of any Rhine in Flames spectacle. Every town and village along the route celebrates the weekend with festivals and events. You're invited to join the music, dance, and Rhineland festivities. Join us too, and experience the festive illuminated Rhine river, its pictorial towns and friendly people! An impressive spectacle awaits you.